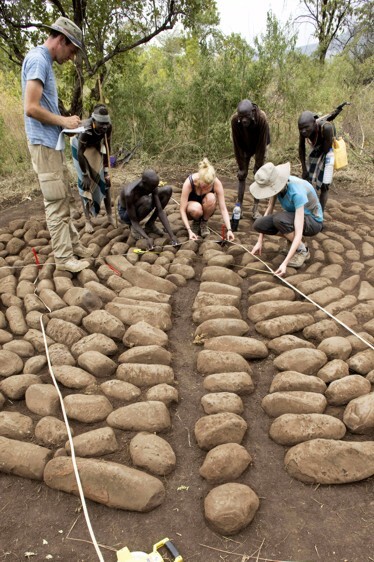 The Mursiland Heritage Project has so far completed three seasons of fieldwork in which around 40 new archaeological sites have been identified, many of which are unique to East Africa. 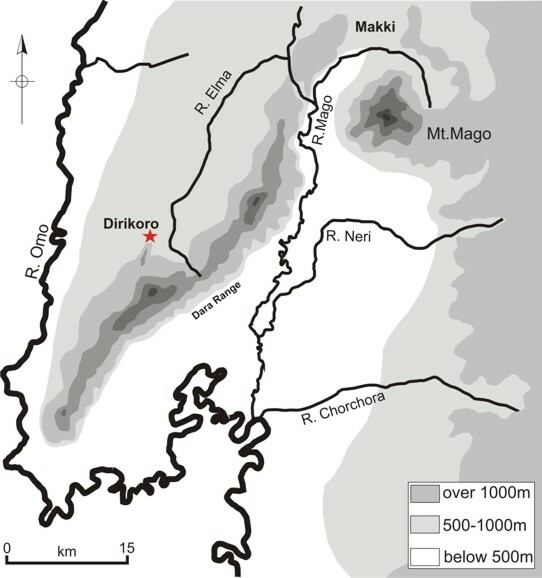 The project has predominantly centred upon an area called Dirikoro, although other important locations nearby include Maiholi and Ulumholi, each situated along the lower flanks of the Dara Range, an elevated volcanic ‘spine’ that dominates the otherwise flat grasslands. More specifically, these locations are positioned within the valley of the Elma River that is one of a number of perennial watercourses that filter towards the Omo. Here the sites are set around a northerly projection on the west side of the Dara Range. This is known locally as the Arichukgirong, which translates as the “cow’s nose”, so-named because of its distinguishing profile. Furthermore, at Makki to the northeast, survey has identified further sites along the steep escarpments of Mount Mago. Foremost, what is clear is that a considerable longevity of human occupation across Mursiland – or at least the study areas within this region – is represented within an archaeological record that, by and large, is visible in a range of contexts, both on the ground surface and within deeper stratified deposits. The first phases of investigation in Mursiland are currently underway, with annual seasons of small-scale fieldwork having taken place since 2009. These have facilitated a detailed assessment of the archaeological potential and character of the region through pedestrian ground survey and small-scale targeted excavation and sampling. Assemblages of Middle Stone Age chipped stones have been found from within sealed contexts, with Late Stone Age chipped stone tools more regularly found individually or in small groups nearer to or upon the ground surface. Striking megalithic sites have been found in various forms, including large circular platforms (the picture to the right is a mid-sized platform), small but substantial cairns, upright stelae, and stone enclosures. And various pottery scatters have been found in both open and sheltered contexts, markedly contrasting in form and fabric to the pottery produced by local Mursi groups today. Further information is provided through the links above, as well as a number of publications, some of which are available to download in pdf.